Descrizione: copertina bianca con titolo in nero, alcune illustrazioni fotografiche b.n. n.t. Opere di Robert Barry, Douglas Huebler, Joseph Kosuth, Lawrence Weiner, con tre testi di Huebler, Kosuth e Weiner. La mostra, organizzata da Seth Siegelaub (Bronx, New York 1940), non esponeva nessun oggetto, pittura o scultura: "RH: So, did you start your gallery to show that type of art? SS: No, not at all; that happened later. When I first had the gallery, in New York from 1964 to 1966, I showed a variety of artists, none of whom I worked with later, except for Lawrence Weiner, who had two exhibitions. (...) One of the problems with running a gallery is that you don't run it - it runs you. It becomes an alienated activity. You have fixed overheads and regular monthly schedules and obligations - a rhythm of work whereby you have to fill up the space. It became very clear to me very quickly that it really was not possible to fill up a space - or the pages of a book - with quality work - whatever that may mean! - with that kind of regular rhythm, under that kind of pressure. This problem led me to think about other possible ways to show art without these kinds of fixed overheads and responsibilities and to rethink the question of exhibitions and galleries. All this, along with the kind of work being done by the artists with whom I was involved, led to the production of (irregular) exhibitions in catalogues, not catalogues to promote or sell work, but catalogues that were the work - or at least, that had a different kind of relationship to the work: exhibitions in outdoor public spaces, in temporarily rented spaces, in post office boxes; a whole series of situations and contexts outside of the traditional art structure - both mental and physical. I organized about 20 projects between February 1968 through July 1971. CG: But undoubtedly it was the January 5-31, 1969 exhibition which was the inaugural event, since it was a group exhibition. SS: For me, it was one project among others, even if it brought together publicly for the first time Kosuth and Weiner, who were living in Manhattan, Barry, living in the Bronx, and Huebler, in Massachusetts. 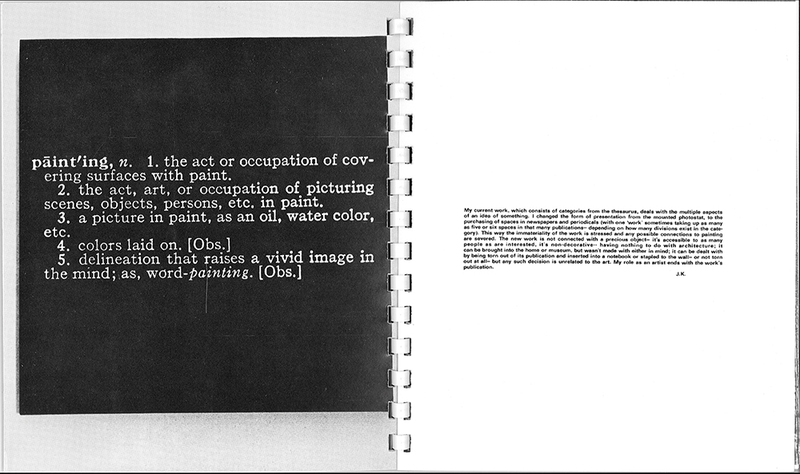 Like all the projects, its preparation and realization were collective: the number of works to figure in the exhibition space (two by each artist) and in the catalogue, which documented these works as well as others which were not included in the exhibition (in total, eight for each artist); and so on" ("Seth Siegelaub: Some remarks on so-called "Conceptual Art" - extracts from unpublished interviews with Robert Horvitz (1987) and Claude Gintz (1989)"). 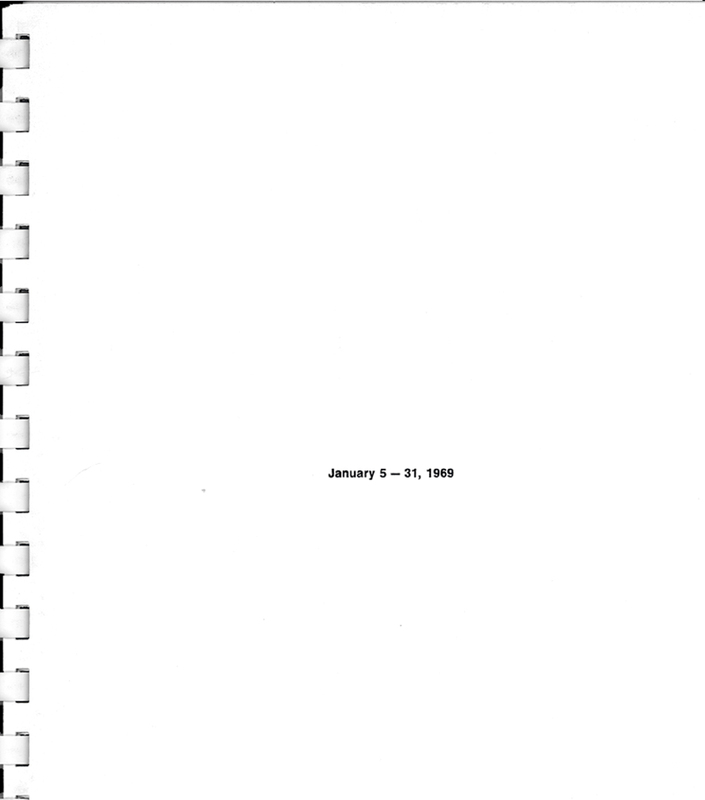 Catalogo originale della mostra (New York, Seth 1100 Madison Avenue, 5 - 31 gennaio 1969).